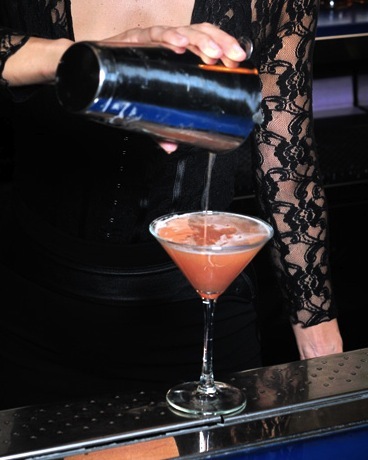 On Tuesday nights the Raleigh Hotel Martini Bar comes alive with good vibes and libations thanks to the mixture of special ingredients. Yes, we are talking about new recipes for our martini list, but more importantly, the magic that happens when talented mixologists, our head bartender Trevor Alberts, and the mahogany bar’s singular, deco charm collide. Martini Culture, held Tuesday evenings from 7:00 p.m. to 9:00 p.m. features a killer schedule of guest bartenders behind the Martini Bar, so far yielding an impressive log of both classic and original martini recipes to add to its growing list. Robert Montero (The Cypress Room,) Hillary Choo (Bar Centro,) Robert Ferrara (Swine,) Ashley Danella (Pubbelly Steak,) Fraser Hamilton (Blackbird Ordinary,) Cricket Nelson (The Cypress Room,) and Ezra Pattek (The Broken Shaker) have so far graced us with their presences, and tomorrow, Hakkasan’s Sarah Lawrence steps up. The anticipation is mounting after receiving her martini submissions, and since everything always tastes better with a story attached, here is hers. The Genuine Kitchen: How long have you been tending bar and where did you get your start? Sarah Lawrence: I’ve been bartending the better part of thirteen years. I got my first taste a few years prior. While visiting my sister, Tamara Schwartz, in NYC, she took me with her to work one night. She showed me how to pour a drink and my passion was ignited! TGK: How would you describe your personal style/approach to drink making? SL: My style is clean and approachable. I want to create cocktails that won’t intimidate the novice, but also appeal to the cocktail connoisseur. TGK: Name an exceptional drink moment from your past. Where were you and what what were you drinking? SL: This past winter I met my old friend Joe Isadori for a cocktail at Saxon + Parole. As we caught up on his new restaurant Arthur on Smith, I enthusiastically discussed my passion for craft cocktails. All the while, I was sipping on the most amazing Spring 44 celery gimlet. Spring 44 is an American distiller out of Colorado doing small batch spirits with care and great ingredients. I don’t like sweet drinks, this was the perfect balance of refreshing citrus, herbaceous gin, and savory celery. The ambiance and conversation, accompanying exceptional cocktails made this the highlight of my trip. TGK: What attributes do you want to see in a bartender when you are on the other side of the bar? SL: I love to eat at the bar and observe service. It is key for them to anticipate and make suggestions. TGK: Describe your relationship to the martini. Is it a drink you like making and how did you approach Tuesday’s menu development? SL: From simple classics to modern twists I love martinis. London in Lavender is a cocktail I created for Hakkasan, a play on one of my favorite classics the French 75. Garden of Hazel is a bourbon based martini, my favorite spirit, inspired by my hometown Oshkosh, Wisconsin. I grew up on Hazel Street where we had fresh rhubarb growing in the garden. I married all of these components into a martini that is perfectly me. TGK: In your opinion, what is the Miami cocktail scene lacking right now. What are we getting right? SL: The Miami cocktail culture is really up and coming. The Regent Cocktail Club and The Broken Shaker are my favorite places to imbibe. The only thing we are lacking are more places like these. Connect with Martini Culture online at raleighmartinibar.com and on Instagram @raleighhotel @RMSatRaleigh with hashtags #martiniculture and #martinibar. The Summer 2013 Schedule remaining is July 9 – Walid Hamid – Avion Ambassador/Mixologist; July 16 – Kaliya Foray – The Broken Shaker; July 23 – Gabe Urrutia – Bacardi; July 30 – Crispy Soloperto – Homecoming Queen.